My initial impressions of the Maritimo S43 are that this boat is fantastic for a day out on the water. 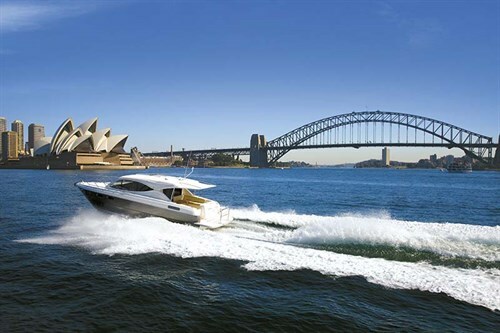 It is a great entertainer’s luxury boat and is ideal to escape for a weekend getaway. Boasting a top end of 32kts and cruising at 20 to 25kts, that special spot to drop anchor and start enjoying the different pace that boats offer is never far away. It’s often hard to find a luxury boat with a configuration that caters to a broad range of desires. Locating the galley on the same level as the outdoor entertaining area has become a must in sedan cruisers and some sportscruisers. Hardtops, indoor/outdoor flow and opening bulkheads have also become popular, while cockpit dining and the ability to fish are often on the wish list too. So, it’s not easy to find a boat that has everything you need in the mid-size market. Yet Maritimo has applied its considerable talent to make all this work within a 43-footer. When you approach this vessel with its metallic paint and clean lines, it appears to be of the same standard as the rest of the Maritimo range. However, upon entering the cockpit, you notice that this model has been tuned to a different dynamic. The cockpit has been turned through 90-degrees, moving the seating away from the transom and tucking it up under the hardtop along the starboard side and facing the galley bench. The aft-facing seating and galley are a real plus if – like me – you prefer looking out from the boat at your surrounds. With the counter-weighted window slid down into the bulkhead, this arrangement really does make the galley bench an immediate extension of the cockpit. The main preparation bench overlooks the aft-facing seating making the galley the ‘best-connected’ position on the boat. There’s enough bench space to be useful and this space can serve as an impromptu bar service area, as well as a food pass. It’s easy to see conversations flowing, food enjoyed and stories regaled in this social arrangement. However, the transom is not without its conveniences. Concealed under two separate lids are the electric barbecue hotplate with sink and a dual-purpose refrigeration unit. The cockpit barbecue chef can operate independently of the galley, having a refrigeration unit to hand, and kept hydrated by a drinks fridge to port. Above this is a flat surface that can work as an outdoor kitchen bench when extra space is needed, or even more conveniently, the closed lid on the transom fridge/freezer gives you extra room. Although, with its smooth flat surface you’ll want to throw a non-slip mat under whatever you’re preparing, to ensure the day’s bounty doesn’t return to the sea. The David Stewart-designed interior on the Maritimo S43 would look equally at home in the Mediterranean as it does plying the waters of the Southern Hemisphere. Light textures and gloss teak finishes are contemporary, with accents of leather bound grabrails and stylish fittings. The galley lends its ample bench space for entertaining purposes, as mentioned. The sink on the end of the galley bench is deep and functional, but begs to be filled with ice and cold drinks, accessible from inside as well as out. Throw a bottle of bubbly on ice – easily reached from the cockpit seating – while devouring fresh prawns from your waterside dining table – an instant summer classic. Indulging the fastidious foodie is possible and cooking can be taken seriously with a four-burner cooktop taking care of the most complex procedures. Below the bench is a microwave and cupboard that can have an optional dishwasher installed for easy clean-ups, while the surrounding cabinetry has ample storage for extended supplies. The only minor detail lacking in the galley is a small ‘recess’ for your toes which would allow you to get closer to the bench during food preparation. Just forward of the cooktop, high-gloss teak cabinetry extends to the back of the helm, a lid concealing what lies beneath. When the lid is lifted upright it reveals the 32in LED TV – a simple and reliable method of revealing the TV, with no actuators required. Below the main lid are two top-opening compartments for crockery and cutlery storage. Cleverly, they are divided in two, enabling plates and cutlery to be removed from one side and placed on the other, without needing the galley bench. 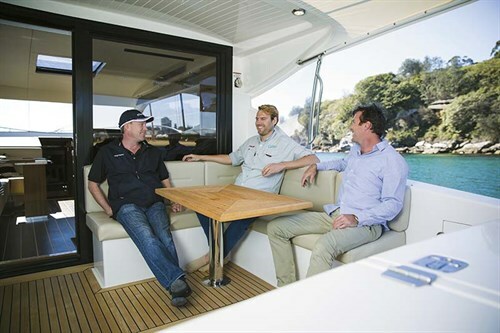 Maritimo’s practical saloon tables are always a feature. Folded in half they offer enough space for a few glasses and small plates and also provide wine storage in the table well. The inboard side of the table also provides a welcome handrail for grabbing underway which is concealed when the table is folded out. South Head was picture perfect and the sea was crystal clear. Completing a few passes with the photography boat was ample confirmation of the Maritimo S43’s ability to get up to speed. The double helm seat has decent vision and offers comfort by way of another simple, yet elegant solution to skippers of varying heights. Rather than being of a fixed height, the footrest bar can be set to three different levels. This takes away pressure on the back of your legs when seated for a long time, which is welcome on long passages and equally good for relaxing at anchor in the helm seat made for two. 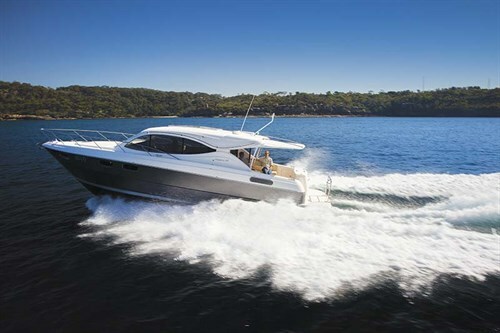 Being a fully enclosed hardtop, the Maritimo S43 lends itself to year-round boating. With reverse-cycle air-conditioning the enclosed cabin can be temperature-controlled in both hot and cold climates. So you can still enjoy those crisp winter days on the water with everything including the galley, dining, entertainment and helm located cosily indoors. It’s the type of vessel that entices you to grab some fresh supplies and head out for a Sunday brunch on the water. Should a day turn into a night, then up to six people can be comfortably housed in berths forward of the saloon. And the accommodation is versatile and luxurious enough to encourage guests to stay a while. 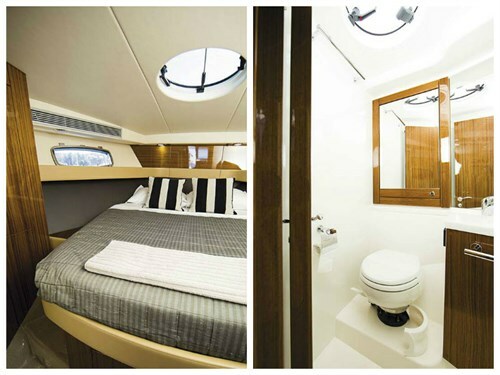 The forward cabin has an island bed with a step up either side. There is enough room to move about with the door closed and storage is convenient. My preferred cabin is the port one, it’s closer to amidships and has an extra-long settee to plonk down on when you enter. The bed tucks under the saloon floor but the extra height at the top end allows you to sit up in bed without issue. If you need to accommodate extra bodies the settee is a Pullman berth, creating two additional single beds when required. The Maritimo S43 has good range at displacement speeds but that’s probably not the way you’re going to use this boat. Up on the plane, you can zip along at a comfortable cruise speed of 20kts, burning 80lt/h. Increase that speed to 25kts and it burns 105lt/h, not bad for a 43ft cruiser. If you think of that in comparative terms, a 300nm passage at 25kts will take 12 hours. But if you were to cruise at 20kts, it’s going to take you another three hours and that extra 25 per cent of time taken has only saved you five per cent in fuel used. Clearly, the moral is, when the conditions permit, cruise at 25kts – and that’s exactly what we did. 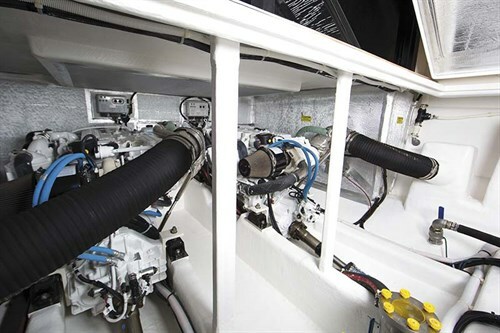 Maritimo’s signature recipe, combining efficiency with simplicity and reliability, results in the pairing of efficient diesel engines with shaftdrives and the right prop pitch. On this model the company chose the 480hp Cummins QSB 5.9 engines. This volume of power seems well-matched to the prop pitch, because as soon as the turbos kick in, the boat leaps forward toward a 25kt cruise speed in smart fashion. Access to the engine room is gained by lifting the cockpit floor laterally with the push of a button on the end of the galley bench. Next to it is another button to lift the rest of the cockpit floor aft, allowing access to the spacious lazarette. Both the lazarette and the engine room are all white with smooth flow-coated bilges. White Cummins engines and the white Onan genset lend the area a clinical look. The engines are fed through oversized strainers normally found on bigger boats, as are the other raw water intakes. It’s all rounded off with an automatic fire suppression system. The Maritimo S43 is a universal luxury boat that offers protection from the elements both in winter and in summer. It has a nice socialising and entertaining dynamic and caters well to water-based activities. Built for weekend getaways, it’s also capable of exploring further afield for an adventurous holiday. Maritimo’s reliability and efficiency give you the ability to travel fast or far and it has the comfort and amenities for you to enjoy when you arrive. As part of a local stable of boats well regarded for their build quality and local support network, it’s well worth a closer look. Twin Cummins QSB 5.9 turbo-diesel engines. * Sea-trial data supplied by Maritimo.